Each year billions of pounds are used unknowingly within businesses by employees desperately trying to manage unstructured documents and processes. Generally this is all done in the in the name of “my job” or “what I do” and ignored as a cost to business by senior management. It is often stated that around 80% of business data is unstructured, (spreadsheets, emails, word documents, presentations, log files, reports and the latest entrant to the unstructured world of data “social media”). With the unending rise in email volumes adding to the ease of sharing information worldwide, utilising services such as Dropbox, SkyDrive, SugarSync, Google Drive etc., isn’t it time you looked at why we seem happy to just ignore the responsibility of making sure our employees (who are trying their best in a difficult environment) have the best management solutions available. Too much background/administration is overlooked within businesses in the pursuit of growth and sales. If, however, we looked at streamlining what we do from an Administration perspective, as a way of acquiring the time and resources to increase growth and sales, then the business gains a win-win! Everyone would agree that efficient ways of working are better than inefficient ones. The difficulty is we all think that the way we approach our work processes is the most efficient way possible. If we look at trends in the IT industry we have seen a rise in the drive to manage and use what has been termed “Big Data”. However when it comes to assessing “Big Data” we find that most of the information we need to assess does not reside in a simple easy to manage a relational database. This is generally, albeit not specifically, down to the fact that the, as previously mentioned, businesses spend little on getting the most from the vast amounts of information being created and received by their employees on a daily basis. Enhancing the power of this business asset has for years been simple and the following are steps that can be taken to get you there. 1. Have a controlled central structure for all documents. 2. Manage all documents and information with respect. If your business is keen to enhance its access to the vast amounts of data it has at its fingertips, or just wants to better manage its documents then the following are worth considering. A. Structure. 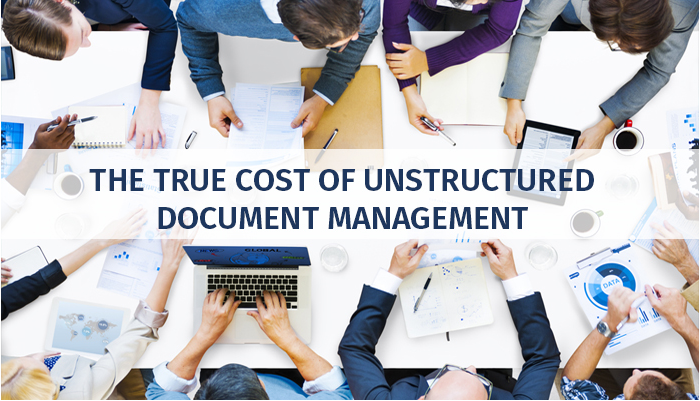 Build or buy a central structure for all documents. The type of system used must be able to support both departmental requirements and the business as a whole. Security must deliver a shared yet secure environment for document needed across departments. It has to be easy to configure and intuitive to the users. B. Capture. Scanning is only one piece of the puzzle, the ability to capture (sometimes automatically) from your email client, office environment, the web, ERP, Finance, CRM or other systems is essential. A system that cannot accept a document from other business solutions will eventually fail to deliver any benefit for the business. C. Integration. Systems integration is a must, the ability to access documents from one system to another is a prerequisite to an efficient time-saving solution. Reducing the human touch points within any business system reduces the time taken and improves efficiency. D. Presentation. Any system should present in a simple easy to use, intuitive manner. If your potential system looks complicated, the take up will be zero. E. Standardisation. Adopting a standardised and consistent method of filing, where documents are saved in the same way sounds obvious. However, this is the most overlooked part of any document structure process.